The vast majority of healthcare is provided safely and effectively. However, just like any high-risk industry, things can and do go wrong. There is a world of advice about how to keep people safe but this delivers little in terms of changed practice. Written by a leading expert in the field with over two decades of experience, Rethinking Patient Safety provides readers with a critical reflection upon what it might take to narrow the implementation gap between the evidence base about patient safety and actual practice. 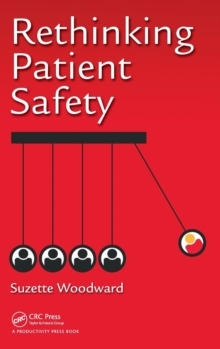 This book provides important examples for the many professionals who work in patient safety but are struggling to narrow the gap and make a difference in their current situation. It provides insights on practical actions that can be immediately implemented to improve the safety of patient care in healthcare and provides readers with a different way of thinking in terms of changing behavior and practices as well as processes and systems. Suzette Woodward shares lessons from the science of implementation, campaigning and social movement methods and offers the reader the story of a discovery. Her team has explored an approach which could profoundly affect the safety culture in healthcare; a methodology to help people talk to each other and their patients and to listen through facilitated safety conversations.